Wetting agents, a soil penetrate specifically designed for use on turf, help make watering more efficient. They help reduce surface tension between soil and water to increase absorption. 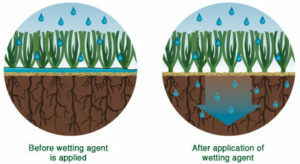 Used on all varieties of turf, home lawns, golf courses and parks, a wetting agent helps get water to the root system. Increasing moisture to the root system helps reduce summer dry stress areas and promotes quicker recovery of lawns damaged by drought. Slopes, hard to wet, benefit by deeper water movement into the soil and reduced runoff. Applying a wetting agent to the home lawn helps increase the efficiency of the water applied. During drought or times of limited watering (restrictions), a wetting agent application will help maximize the benefit of available water.